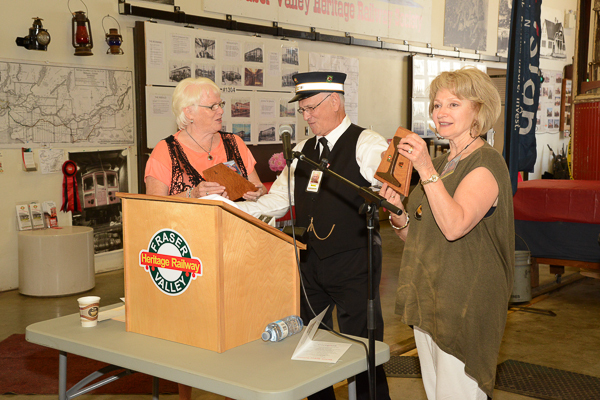 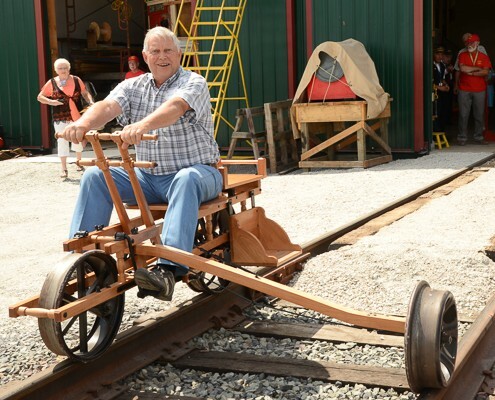 It was a special day at the Surrey Heritage Rail operation on August 22, 2015. 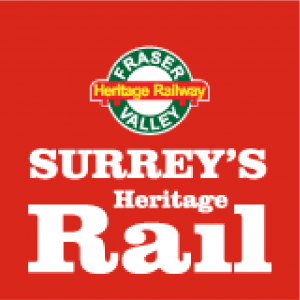 The professional troupe called the Re-enactors, was scheduled to perform at the railway station, recounting the history of Surrey and it’s town centre of Cloverdale of one hundred years and more. 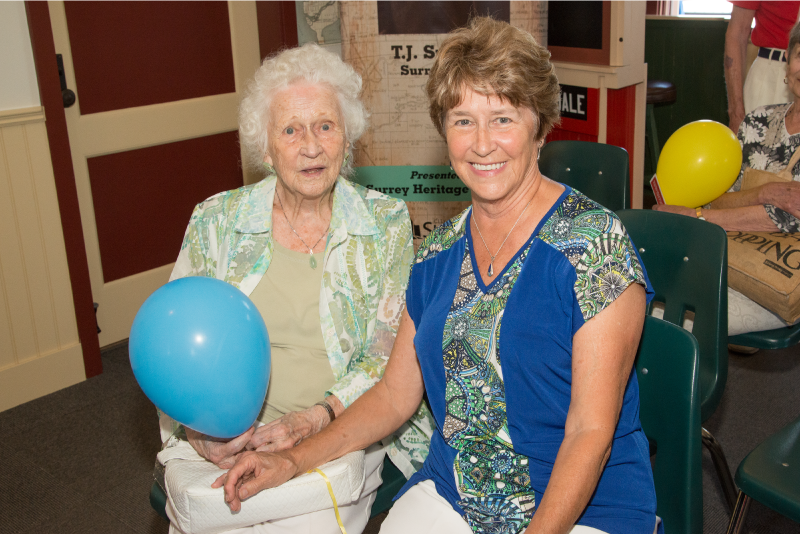 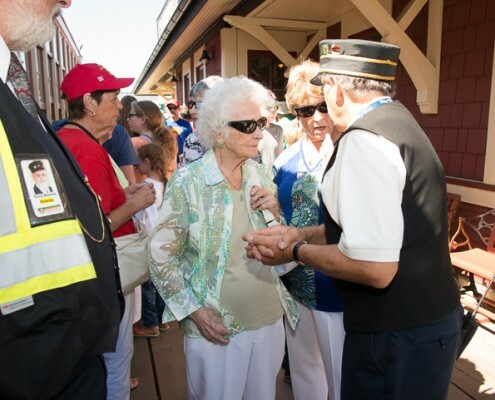 It was an additional surprise and delight when the Wise family arrived to ride the train and celebrate their mother, grandmother and great-grandmother’s 100 birthday complete with balloons and cake. 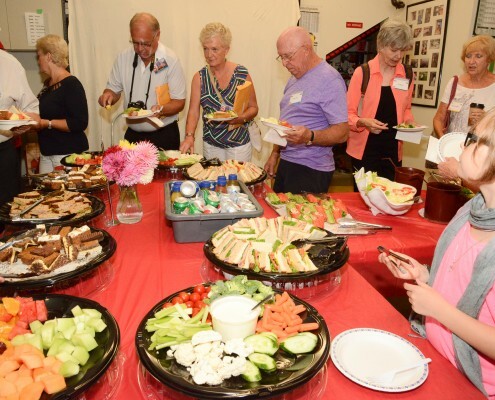 But first Clara and her family were invited to participate with the actors in a recreation of a school class, a visit from the Reeve, and a number of other characters of our history. 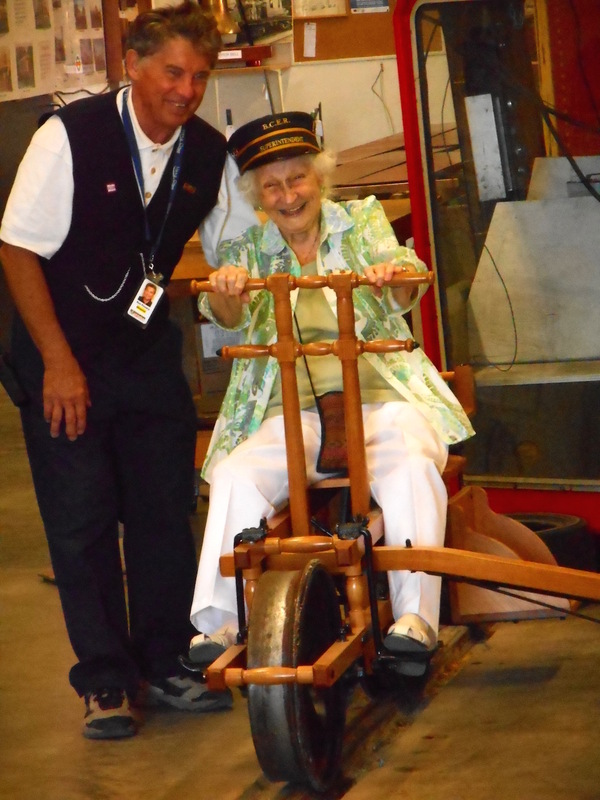 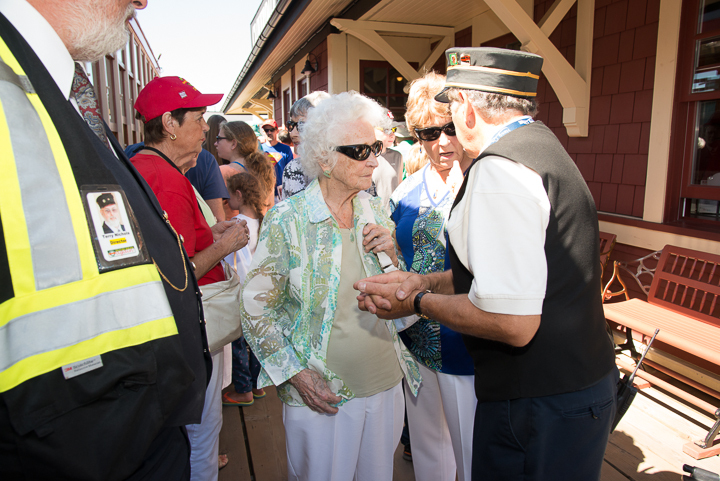 After the singing of Happy Birthday, Clara was escorted aboard Car 1225, just three years older than she, for a ride to Sullivan Station and back. 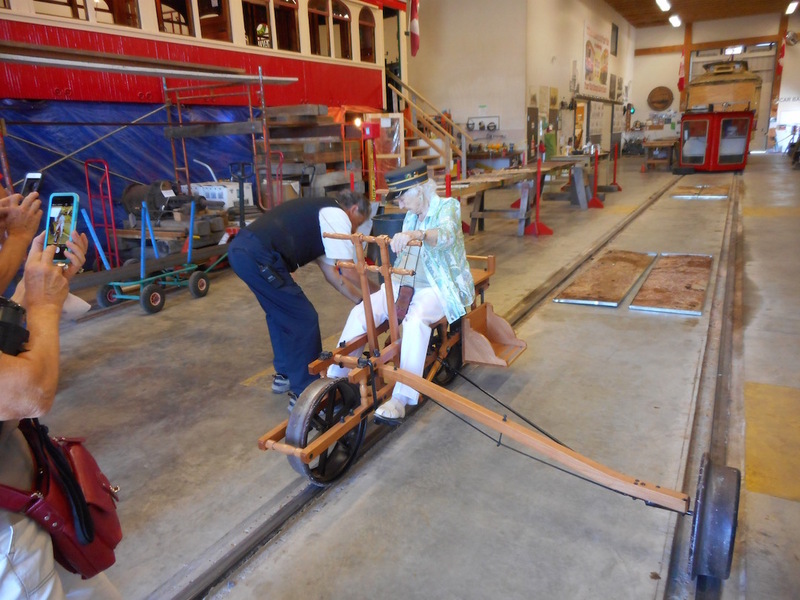 After the big train, she enjoyed a ride on the speeder, and climbed on the hand-cart called a velocipede, which she operated herself. 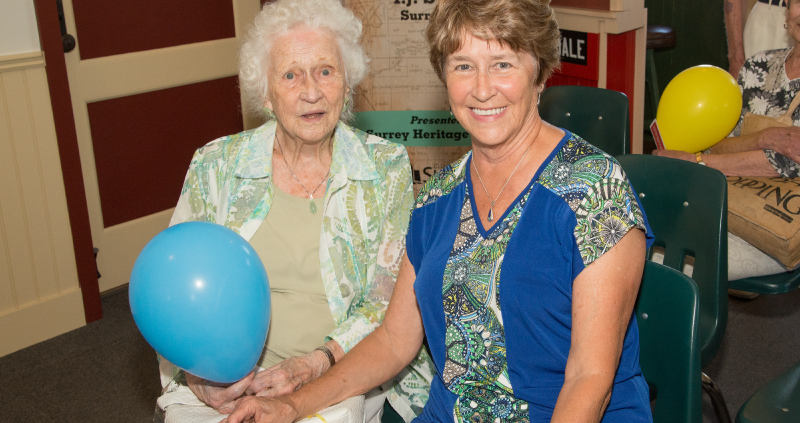 Word has it that Clara outlasted some of her younger family members. 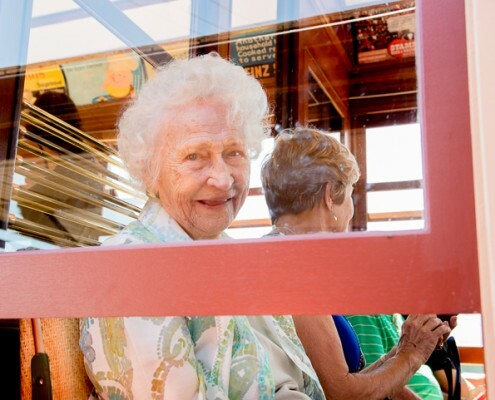 She definitely had a wonderful time. 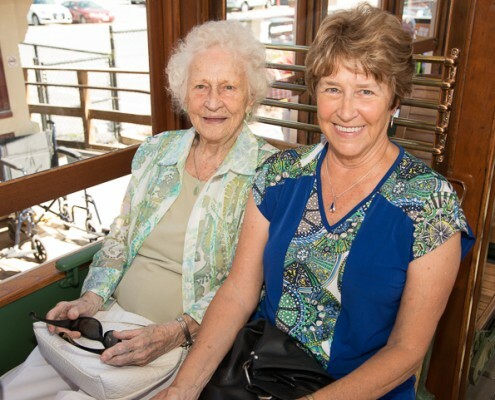 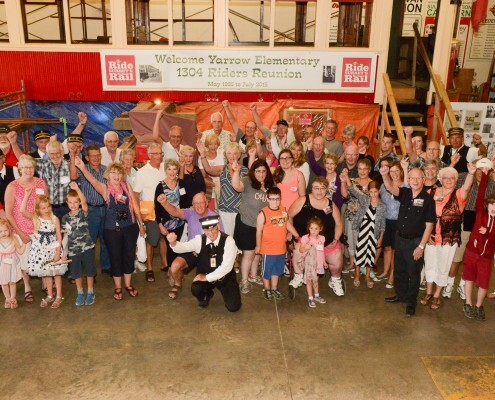 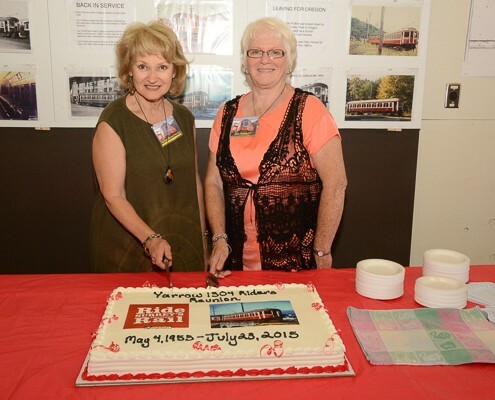 About ninety people arrived at the Cloverdale Station to relive an event that occurred in May of 1955 when the Grade 3 Class of Miss Joy Fowlie, from Yarrow Elementary School were the last passengers to ride aboard BCER Car 1304 from Chilliwack to Yarrow. 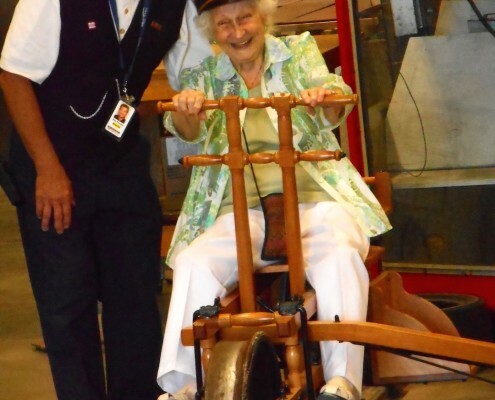 Miss Fowlie contacted BC Electric President Del Grauer, to ask for the ride so she could complete a transportation unit in her curriculum. 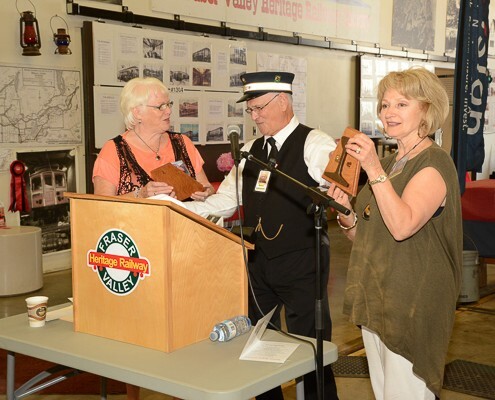 This despite the fact that the Interurban line from New Westminster to Chilliwack had been discontinued three years earlier. 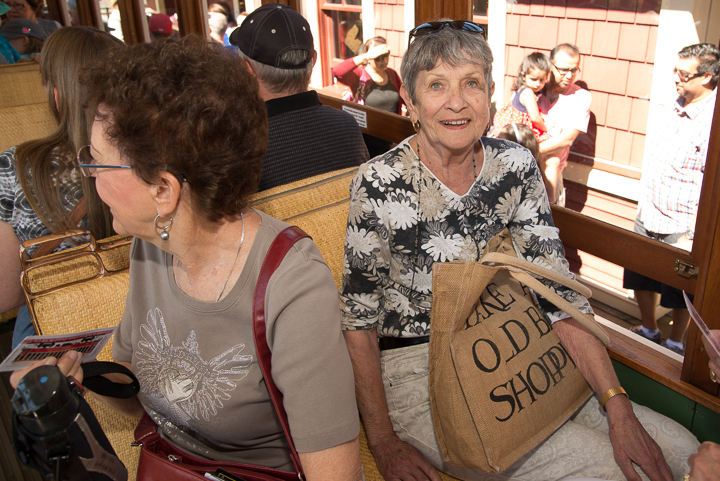 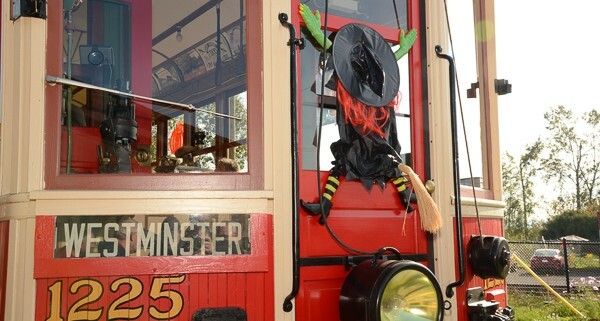 With the trolley wires removed, there was no way for the electric train to operate on its own. 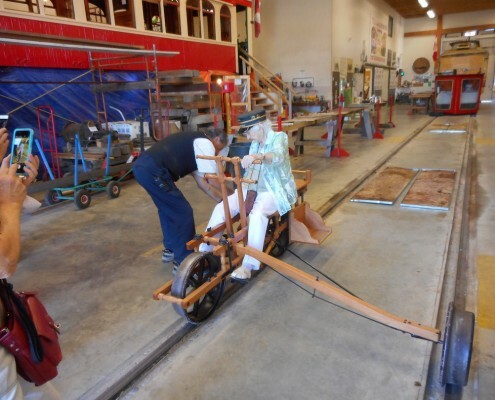 So Grauer authorized Car 1304, now retired and awaiting removal to a trolley museum in the states, to be towed to Chilliwack with one of the BC Electric Freight trains, which were still running freight through the valley. 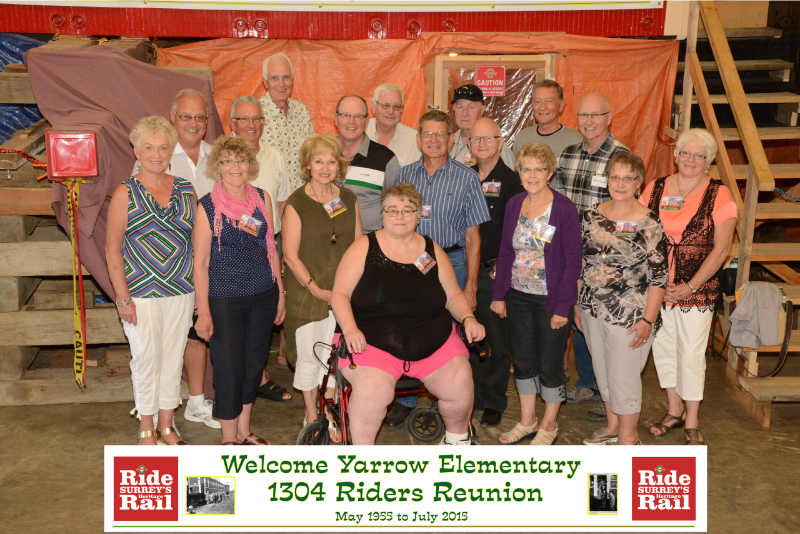 In May of 1955, the Grade three class was bussed to Chilliwack where they were put aboard car 1304 for the ride back to Yarrow. 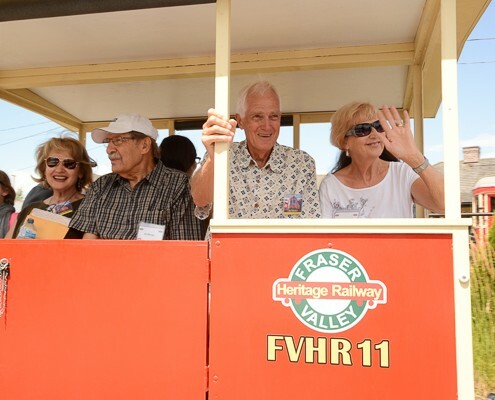 Fifty-nine years later, Car 1304 has been repatriated to Canada and is now part of the Fraser Valley Heritage Railway Society, and undergoing restoration in its facility in Cloverdale. 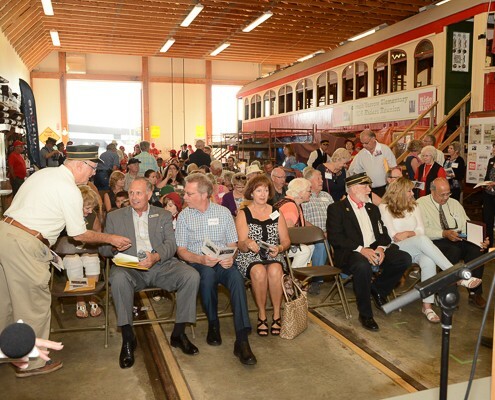 As a feature of the Surrey Heritage Rail (SHR) operation of Interurban Car 1225, the Society also offers a tour of the rehabilitation facility, known as the Car Barn, to explain the history of the BC Electric Railway. 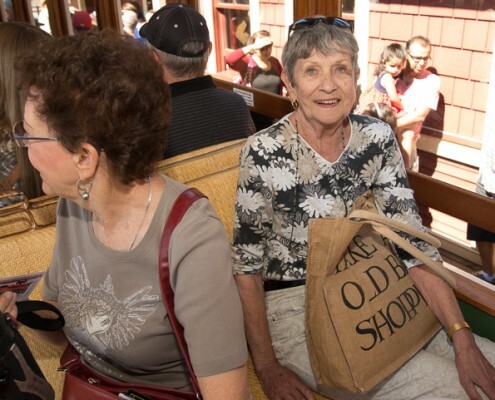 One of the exhibits recounts the 1955 Train Ride, when one of the guests told the tour guide that she knew many of the people in the story, and had also been a student at Yarrow Elementary at the time. 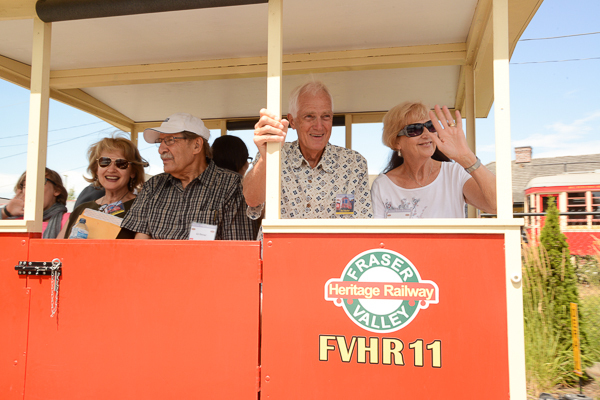 The result was an offer by the SHR to host a reunion of the remaining riders, their children and grandchildren. 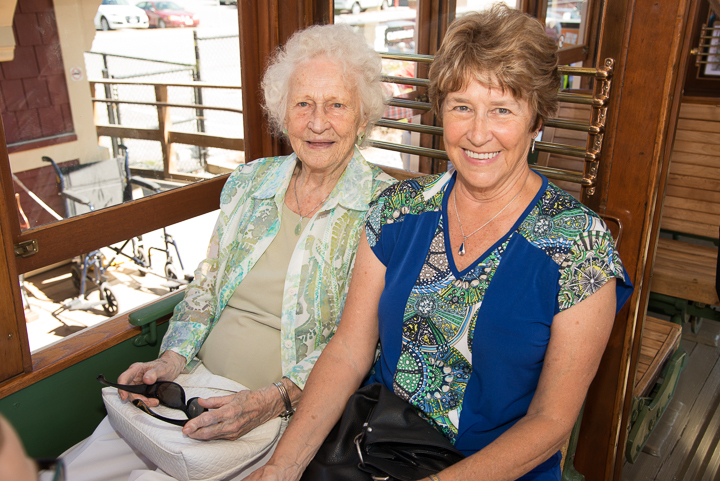 This occurred on a sunny and warm Thursday, July 23, 2015. 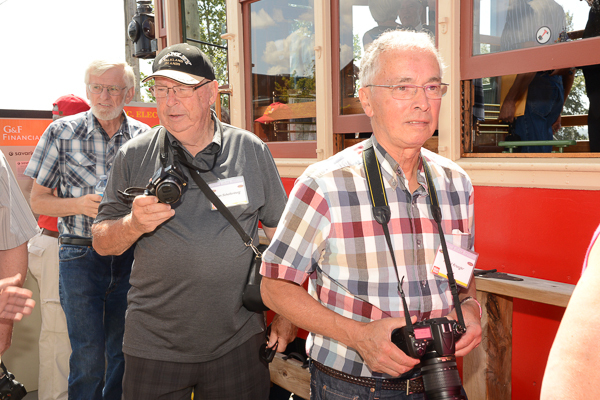 On hand to help with the festivities were representatives, Councillor Dave Woods representing Surrey, MLA Marvin Hunt and a representative of Cloverdale MLA Stephanie Cadieux representing the Province. 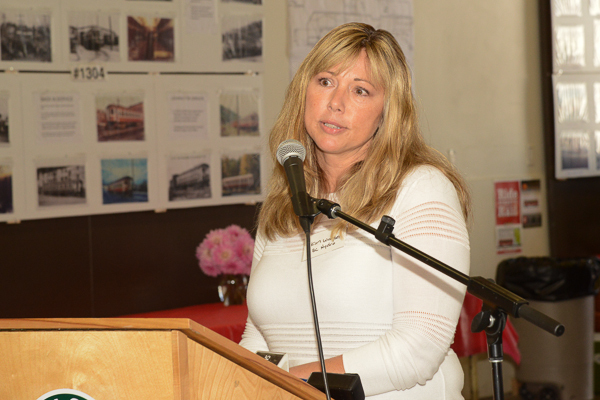 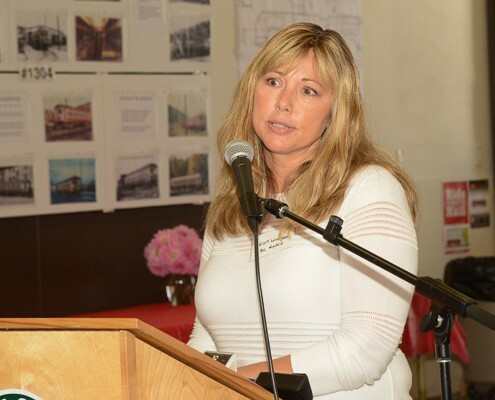 Our other partners, Kim Wagner of BC Hydro the successor agency to the BC Electric Company and Singh Biln, represented SRY Raillink, which now owns and operates the Fraser Valley rail route which was the Fraser Valley line of the BC Electric Railroad. 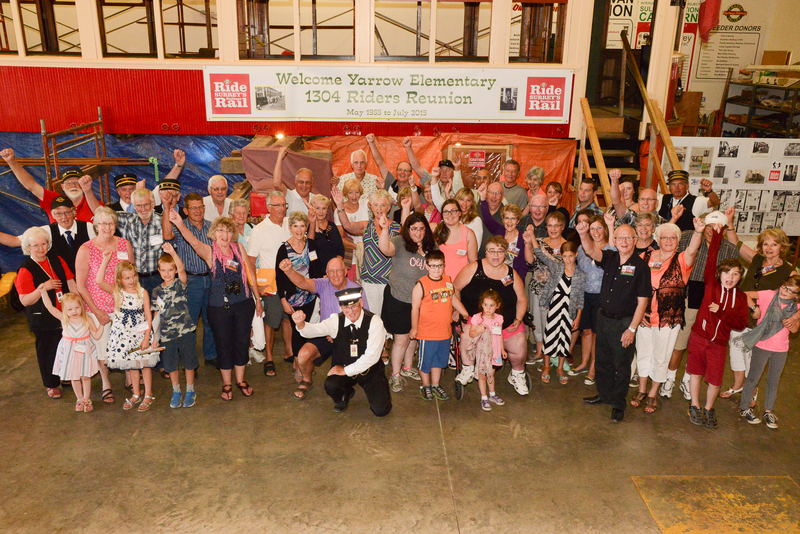 Greetings were also brought from Yarrow Elementary School by one of the current teachers. 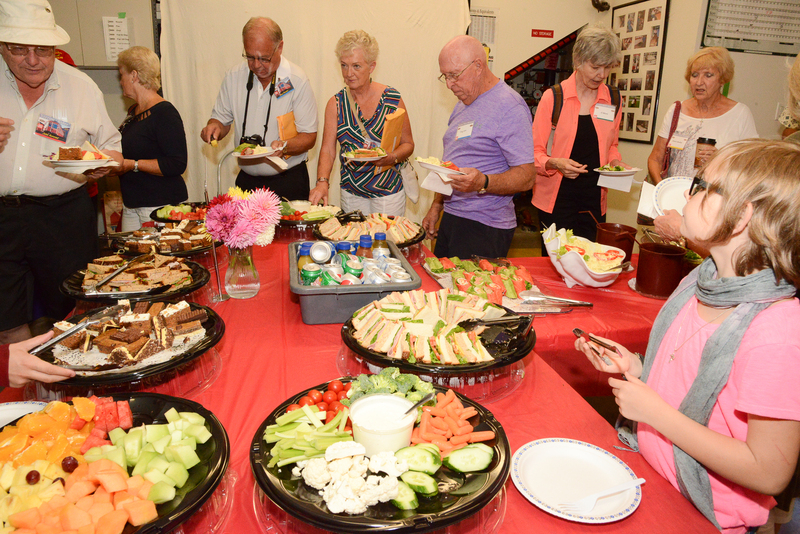 After the official greetings the group was treated a buffet lunch provided by Kay Gandham, the manager of the new Cloverdale Branch of Envision Financial. 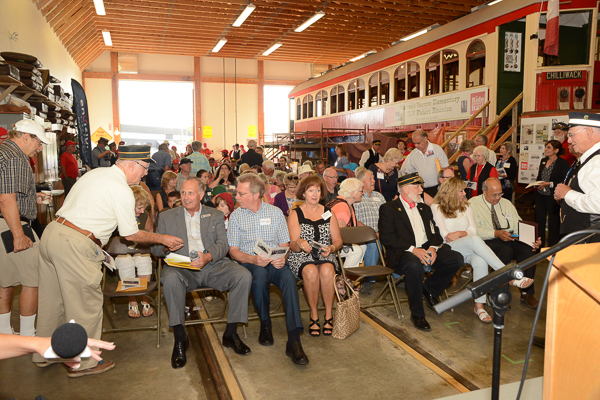 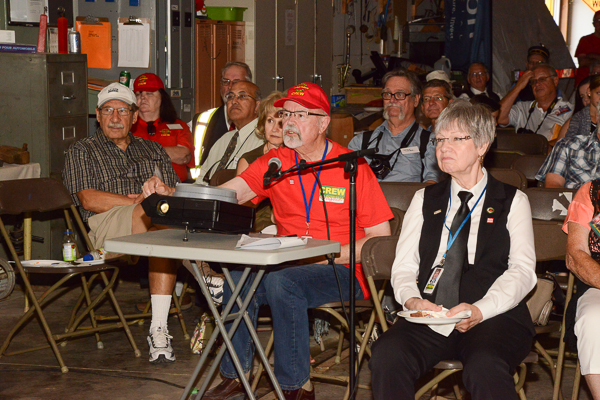 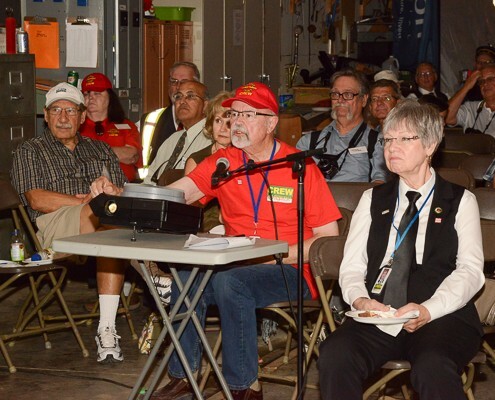 During the lunch, Historian Henry Ewert presented a slide show and talk on the history of Car 1304 and the Interurban. 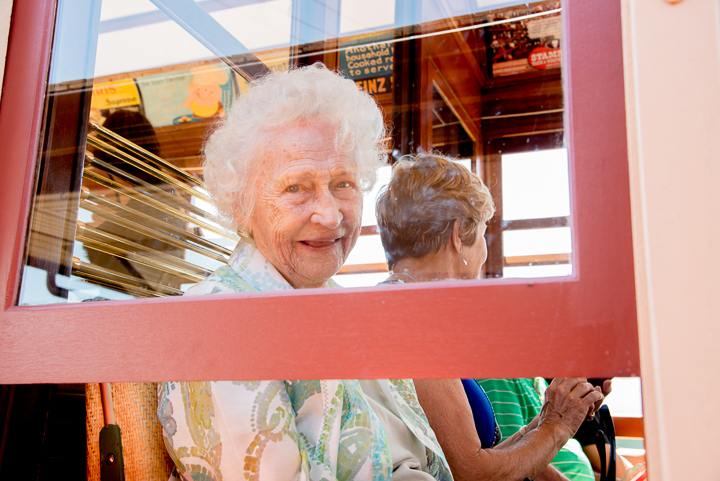 This was followed by a tour through the car, which is still under restoration, and a group photograph in front of it. 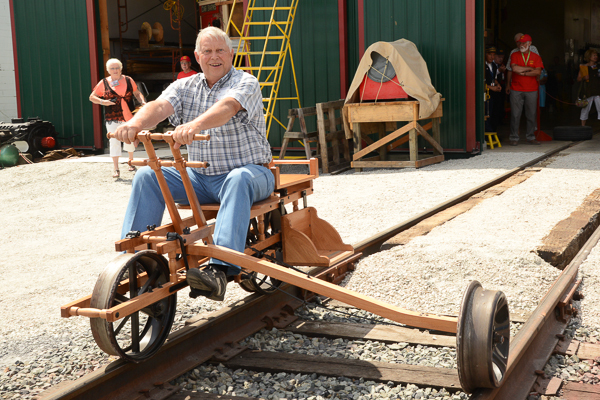 After that it was fund and games as our guests of honour rode Car 1225, the Speeder, the velocipede and explored the Cloverdale campus. 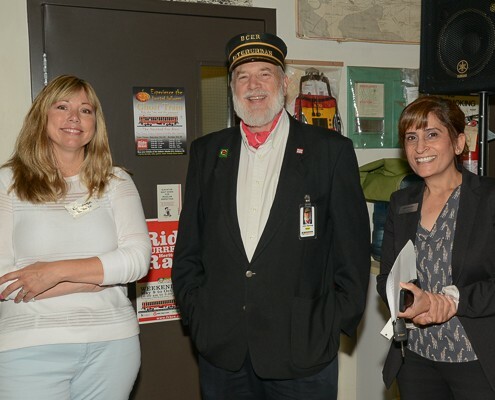 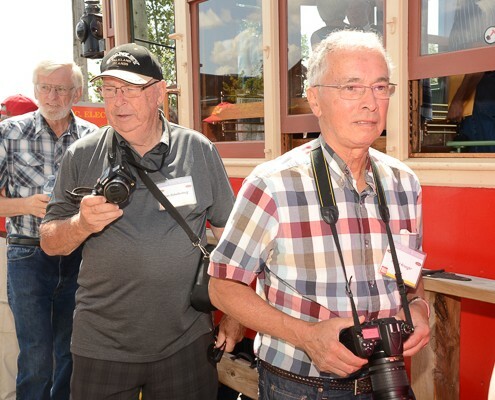 During the train ride they were accompanied by reporters including the publication, the Cloverdale Reporter and video crew led by Leah Bolton from Joy TV, who subsequently produced and broadcast a documentary program on the event. 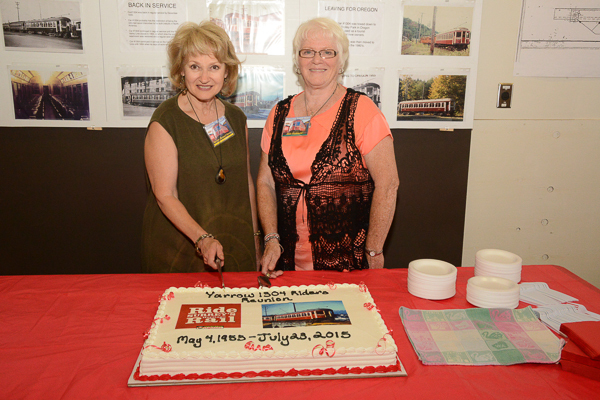 Thanks too to News 1130 who also promoted the event. 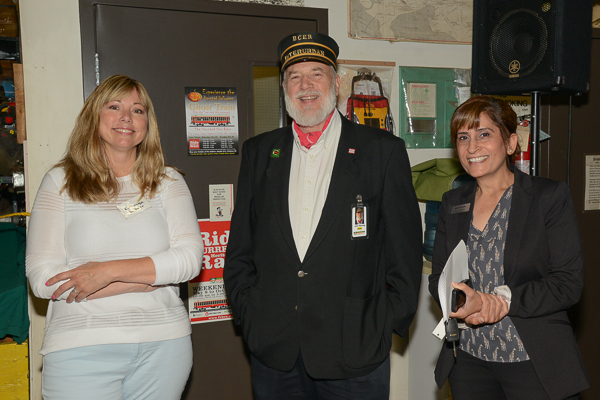 Congratulations to Director Hugh Parkinson who originate and coordinated the event.